joedawson via FlickrTonight the Underground Rebel Bingo Club hosted a night in Manchester for Vauxhall Motors, offering the chance to win a brand new Corsa!! Tickets for the event were free, but strictly limited to 500 which meant that we had to attend! I secured tickets for the event but the challenge wasn't gaining tickets but navigating to Manchester in blizzard conditions. No problem! We had intended to participate with friends but they weren't brave enough to commit to the adventure. The Monastery, Manchester hosted the action and I travelled there with my partner who was also had her eye on winning the car! The venue, is an architectural masterpiece, and following a £6.5 million restoration scheme, has taken its place as one of the UK’s most inspiring venues for any corporate, social or cultural occasion. The night lacked the usual Rebel Bingo energy, but it was still enjoyable. 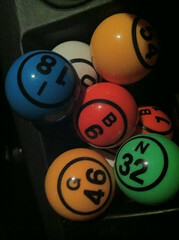 We didn't win anything but instead managed to obtain several Bingo balls! We will persevere, the obvious sentiment being that if at first you don't succeed... We shall return in the new year, with every intention of securing - at the very least - a Panda! We took a detour on the way home, discovering a drive-thru Subway and to also visit the home of Manchester United - The Theatre of Dreams.